Roses can be expensive plants, but they last for many, many years and are easy to establish if you follow a few simple steps on planting and aftercare. Bare-root roses: These are only available from about November to March usually mail order. These are plants dug from open ground and packed to prevent the roots drying out before sale. Bare-root plants are usually good quality, having a wider root spread than containerised plants, and they are often good value. They should be planted as soon as received, or if ground conditions are unsuitable, unpacked and kept in a container of slightly moist compost and planted as soon as conditions allow. Containerised roses: These are at their best in garden centres from about November to March. They may be available to buy like this for longer into the spring and summer, but quality starts to suffer the longer they are kept on display. They are bare-root roses placed in pots of potting media to prevent them drying out. They should be planted as soon as received. Container-grown roses: These are available all year round. These are roses that have been grown in containers for a whole growing season or more. They can be planted at any time, (but are usually not such good plants as bare root ones) and are comparatively costly. Bare-root roses: Plant in late autumn at leaf fall, and from late winter to early spring, before growth resumes. Avoid planting in the middle of winter when the ground is frozen. Containerised and container-grown roses: Plant all year round, provided the ground is neither frozen, nor very dry. In the area where the rose or roses are to be planted, mix in at least one bucket of well-rotted organic matter per square metre, forking it into the top 20-30cm (8in-1ft) of soil. Farmyard manure is ideal for this. Apply general fertiliser, at 100g per sq m (3oz per sq yd) over the surface of the planting area and fork it in to the same depth as the organic matter. Note: if you are using a mycorrhizal fungi (e.g. Rootgrow) then it is best not to apply a fertiliser at all as phosphorus (found in general fertilisers and superphosphate) can suppress the fungus. For each rose dig a hole roughly twice the width of the plant's roots and the depth of a spade's blade. Carefully tease out the roots of container plants because, if this is not done, the roots may be very slow to extend outwards, leaving the young plant more susceptible to drought in summer. Place the rose in the centre of the hole and, using a small cane to identify the top of the planting hole, ensure the graft union (i.e. where the cultivar joins the rootstock and the point from which the branches originate) is at soil level (not below as this is reported to increase the risk of rose dieback). Back-fill gently with the excavated soil and organic matter mixture. Spacing depends on type and habit. Check catalogue or label details. If you are replacing old roses with new roses, ensure that you dig out the soil to a depth and width of 45cm (18in) and exchange it with soil from a different part of the garden, as roses are at risk from replant disease, also known as soil sickness. In subsequent years this programme of feeding and mulching can be repeated annually. 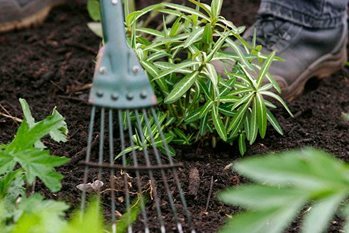 Apply the fertiliser over the existing mulch, from where it will quickly find its way down to the roots, and then top up the mulch to maintain it at the original level. Roses may struggle to establish, especially if planted poorly, provided with little aftercare, or planted where roses have grown before. They can also suffer from a range of common rose diseases, such as rose blackspot, rose dieback, rose powdery mildew and rose rust. Pests to watch out for include large rose sawfly, rose leaf-rolling sawfly and rose aphids.